Attendees of the Ms. JD seminar learned about the advantages of a law degree at the University of Houston Law Center. 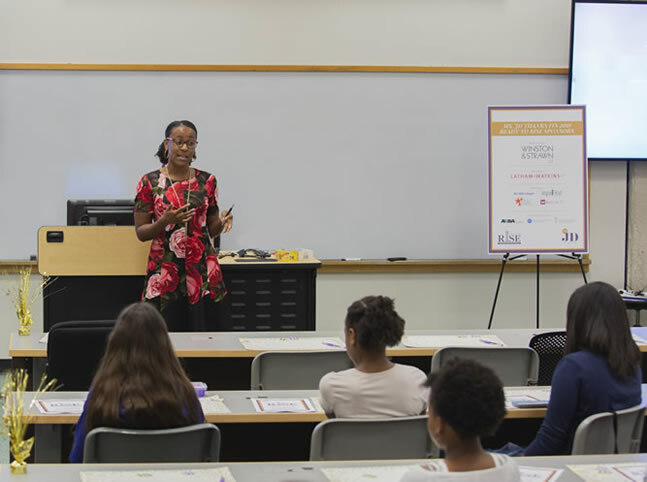 June 28, 2018 — Sixty girls from junior high schools from across the Houston area were introduced to the world of legal education during an informational workshop last week at the University of Houston Law Center. The event, "Ready to Rise: A Law & Leadership Academy for Girls," was presented by Ms. JD., a nonprofit, nonpartisan organization that describes itself as "dedicated to the success of aspiring and early career women lawyers." The workshop featured inspirational speakers who discussed the journey to becoming a lawyer, life as a law student, and included other interactive games and activities. Kathy Cheng, an attorney based in Houston, spoke to the audience about how much of an asset it is to have a J.D. "Having a law degree is the best thing I could have done because when you have a law degree, you are not only limited to practicing as an attorney," Cheng said. "That is the ticket to every industry. No other career would give you such a wide window of opportunity." Cheng also encouraged attendees to display bravery throughout the course of their education and careers. "If you look deep in your heart, you find that courage," she said. "If there's something you're really passionate about, whatever fear you may have will eventually subside and that courage will take over." Dr. Creshema Murray, an assistant professor of communication studies at UH-Downtown, led a discussion on maintaining professionalism when using social media. "We must be smart and savvy women to make sure that we actively, and not passively, control the messages that we put up online," Murray said. The event concluded with a reception featuring cupcakes, refreshments and a special gift for each of the middle school girls from Kendra Scott, a fashion and jewelry designer. Additional speakers included Daniella Landers, a partner at Reed Smith, Robine Morrison, an associate at Winston & Strawn, Law Center student Sami Adhikari, Demetra L. Liggins, a partner at Thompson & Knight and LaMonica Orr-Love of Love Law Group and Consulting Services. Sponsors included Winston & Strawn, Latham & Watkins, Legal Kid, Texas Women Lawyers, Kastl Law, The Little Lawyers and the Hispanic Bar Association of Houston.